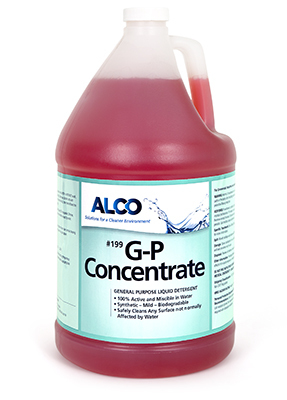 Alco GP Concentrate - Alco-Chem, Inc. Highly concentrated all purpose cleaner, dilutes up to 128-1. Safe on all washable surfaces. An outstanding scrubbing detergent for floors. Non-caustic. pH: 9-10.